Cashmere, alpaca, camel, angora, mohair and yak are specialty fibres with timeless appeal and elegance. These fibres are associated with exclusivity and traditional luxury and their scarcity enhances their status and adds to their value. All of these fibres are exceptionally warm, which means that a fine yarn will be just as warm as a thicker yarn spun from wool. They give warmth without bulk so that a small amount goes a long way. Luxury fibres are ideal for blending and work particularly well in blends made of a third of luxury fibre, a third of wool, and a third of tussah silk. Buy one or more types of luxury fibre to spin your own special yarn. Read more about each of our luxury fibres. Alpaca fibre has several advantages over sheep wool. Alpaca’s hollow fibres are warmer and smoother than wool, drape better and have a low prickle factor, making alpaca a great alternative to anyone who finds wool itchy. Unlike wool, alpaca has minimal lanolin content, making it hypoallergenic in comparison with wool. The fibres have less scales than wool, and look brighter because they are better at reflecting light. Alpaca comes in a range of beautiful natural colours, from glossy dark black, to soft greys, and warm browns (dark brown, light brown and fawn). Alpaca is the ideal fibre for those who like natural colours and it is great for mixing with fibres dyed with natural dyes. Try combining natural alpaca colours with white alpaca dyed with natural dyes (for example indigo and cochineal). Grey alpaca is ideal for dyeing, producing mossy greens with yellow natural dyes and steel blues with indigo. Alpaca fibre is great for spinning into yarns that you can use to knit jumpers in natural colours, as well as for weaving into shawls or tapestry weaving. Angora fibre comes from the fur of the angora rabbit (rather than from the angora goat) and this breed of rabbits has an extra long coat which is clipped every three months. Angora fibre has two important characteristics, it is whiter than any other natural fibre and it produces a yarn with a beautiful furry halo. Angora fibre felts easily and must be washed with great care. It is also exceptionally warm and lightweight, and is best used in blends, for example, with a 1/3 angora for warmth, 1/3 tussah silk for strength and 1/3 wool for elasticity. Camel fibre comes from two-humped Bactrian camels that live mainly in the Gobi desert. Our fibre comes from the soft and downy undercoat of baby camels and has a natural sandy camel colour. 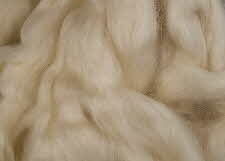 Camel fibres are soft, light and warm, as well as very fine, 17 to 19 microns in diameter. This fibre does not felt very easily, so it is easier to care for than other luxury fibres, and it is much more affordable than cashmere. Baby camel is a lighter and yellower brown than either Shetland moorit or brown Blue Faced Leicester wools. Cashmere fibre comes from the downy undercoat of the cashmere goat. These fibres are soft, very warm and superfine being 14 to 18 microns in diameter. Cashmere has good crimp (each fibre has tiny waves) resulting in a yarn with excellent elasticity. Cashmere has low lustre and you may like to combine it with silk for added shine. Our cashmere is de-haired and of excellent quality. Mohair fibre is notable for its high lustre and sheen, and it takes dyes very well. Our fibre comes from kid mohair, at 24 to 26 micron. Mohair is both durable and resilient, it is also resistant to abrasion, making it a natural substitute to nylon in sock wool blends; it is also useful for warp yarns. Although mohair has good insulating properties, clothing made with 100% mohair may feel cold to first touch. Textiles made from mohair have good crease resistance and tend not to felt or shrink. Mohair is made from the hair of the graceful Angora goats, which have a single coat and often have spiral horns.